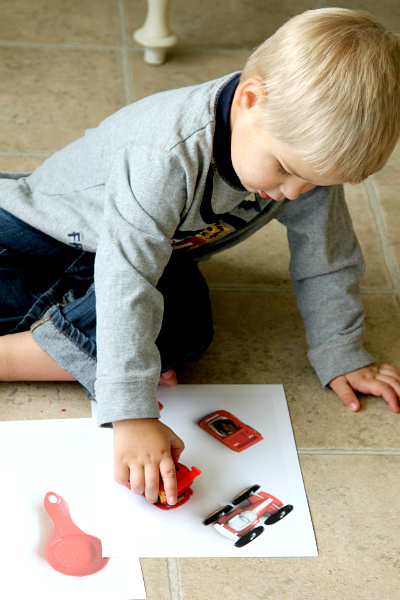 Create your own match game for toddlers. 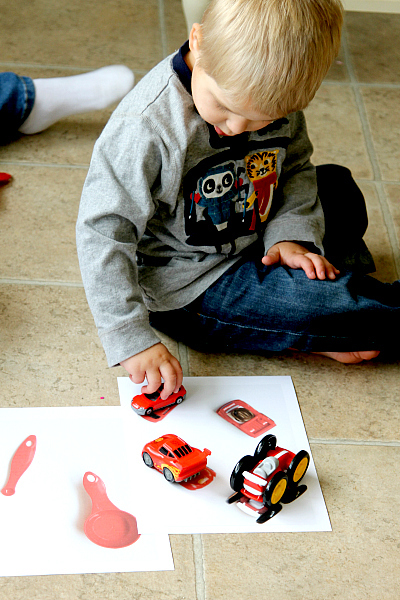 This is a fun and easy activity that can be customized for personal at home teaching and play. Such an easy idea, you can pick out items in your home and create sheets any time you want! 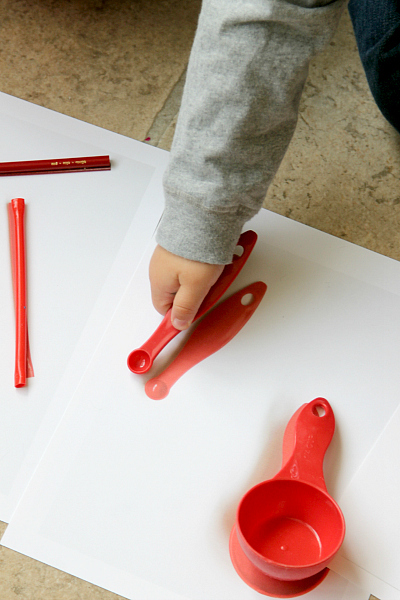 See below my tutorial on how to match colors and shapes for teaching play time. When you have two kids that are as far apart in age as I do, you really have to take some extra thought to make sure they can be relat-eable and interact together. So today I wanted to do something I have had on my mind but have yet to put together and after seeing this great article from One Perfect Day, it spurred me on to stop putting off my ideas and actually DO them. Big Kids First: While I didn’t tell her what I was going to do, I sent Charlotte (9) off in the house to collect “small items” with a focus on red. She was pretty excited and it allowed her to be involved as the “big” kid. She had a great time collecting things on her mini scavenger hunt and came back with a pile of cute toys and house hold items. 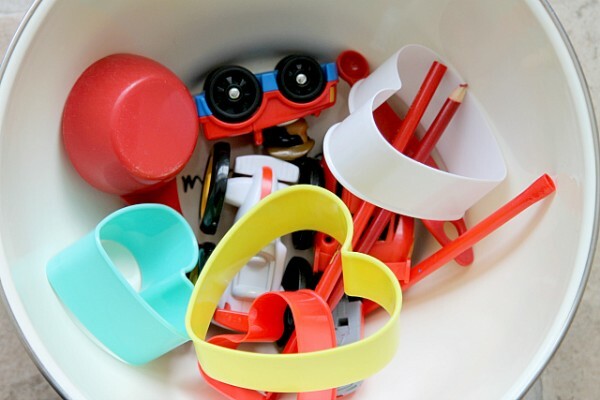 I then added a few kitchen items to the mix like cookie cutters and measuring cups because they were easy to recognize with a color and shape difference. I laid all of Charlotte’s finds out on white card stock and took photos of them on the sheet. After I had photos of each set of items, I went to the computer and pulled up Canva.com, added them to one file and saved as a PDF. After my activity sheets were saved, I printed them out. Meanwhile, Charlotte added all the items to a big bowl and laid out the sheets for Phoenyx. Now that we were ready to play, we invited Phoenyx (2.5) over. He was really excited to see a station set up! Charlotte handed him items and he “matched” them to each sheet. He even did a fantastic job making sure all the cars and pencils were facing the right direction without any prompts! After he completed each sheet, Charlotte mixed all the items up again in the bowl. He pulled them out one by one to match again. 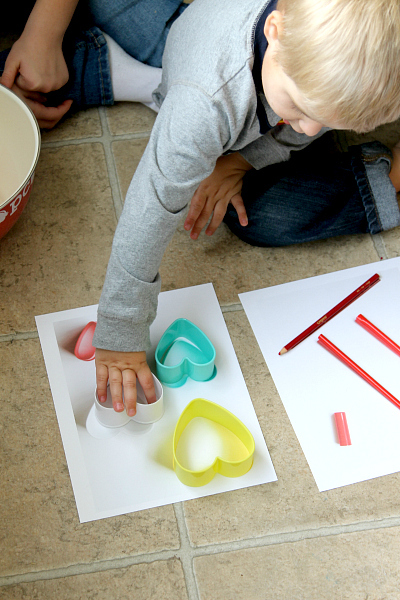 Phoenyx had so much fun doing this that we gathered more household and kitchen items to make a few more sheets. Now that bowl is filled up to the brim! The wonderful thing about an activity like this is that you can alter it for any age, group by colors, shapes or “like” items and it’s great year round. Think about making a seasonal sheet, color focus, shapes, money, flowers and more! The possibilities are endless and the entire process set up was under 15 minutes but provided 45 minute of play off of 6 simple sheets. Charlotte and Phoenyx got along and played TOGETHER the whole time. Tip: To make this more difficult for older kids, add un-matching items in the bucket so they have to sift through to find the exact item they need. If you are like me and have had this idea but yet to put it into play, I suggest that you do! It was a lot of fun and it kept BOTH kids happy, interacting, and off those electronics. « Valentines Day Shoulder Friends: I am stuck on you! Oh I love this idea, and the possibilities are endless. Thanks so much for sharing with the Pin it Party. Am off to check out Canva now to give this a go myself. have pinned and shared.